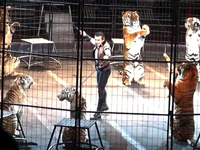 Animal Defenders International : Animals in entertainment : Plymouth, MA Bans Use of Wild Animals in Circuses! Plymouth, MA Bans Use of Wild Animals in Circuses! ADI worked closely with local supporter Kati Carloni, who successfully petitioned Article 35 in the town warrant and used our evidence to inform Town Representatives about the inherent suffering and public safety issues surrounding the use of wild animals in traveling circuses, as documented in a recent article in the Allston-Brighton Wicked Local. After reviewing the evidence, the Plymouth Town Representatives voted 75 to 47 to enact the new bylaw. ADI applauds the Town Representatives for taking a stand to help stop circus suffering in Plymouth, MA.